Perla, at 810 O St., NW, is slated to open in the fall. 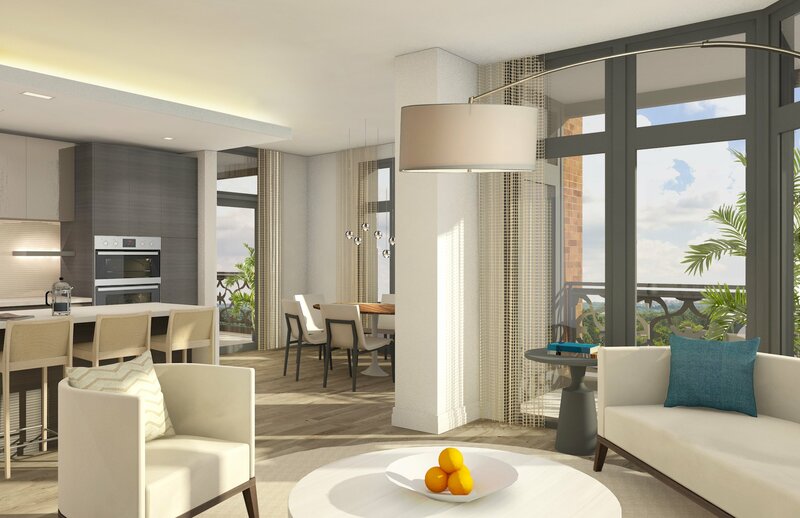 Renderings courtesy of Four Points. Just six years ago, the site at 9th and O streets, NW, was home to one of the best known black churches in the District. But, after much of its congregation moved to the Maryland suburbs, Scripture Cathedral decided to sell its building and follow its parishioners to Prince George’s County. 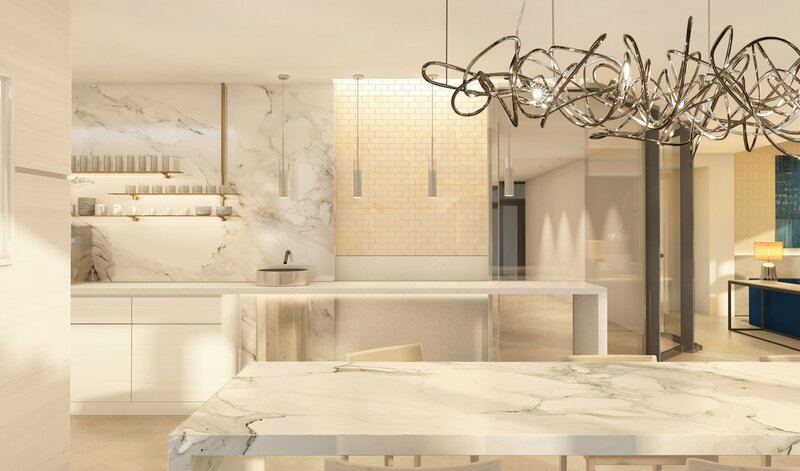 Now, in another sign of how rapidly Shaw continues to change, an ultra-luxe condo building—with units reaching $2 million—is rising in its place. Perla, developed by Four Points, is scheduled to finish around Labor Day, with 66 units and 6,900-square-feet of ground-floor retail. 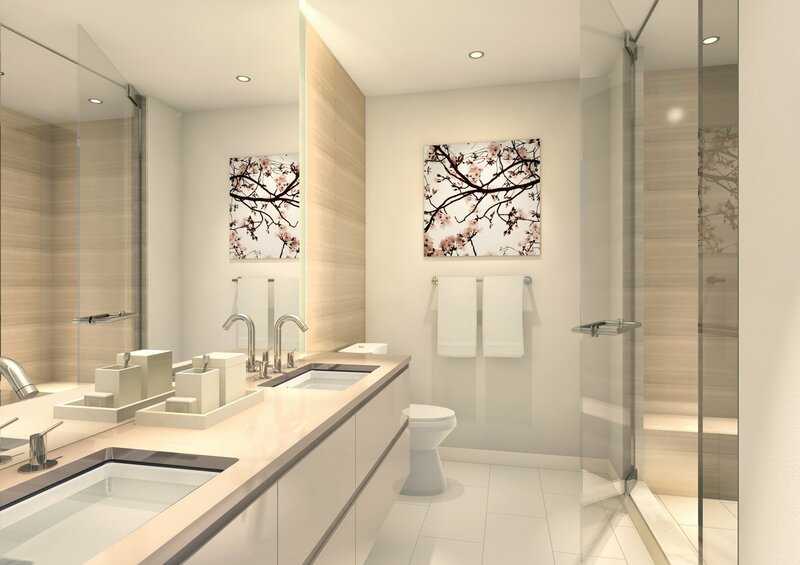 One-bedroom condos there will start in the $600,000s. 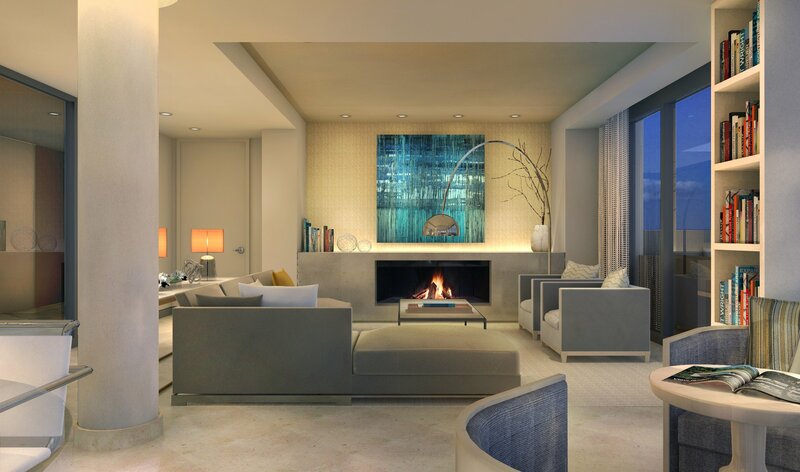 The largest, most expensive units will exceed 1,800 square feet, and come with two bedrooms plus a den. 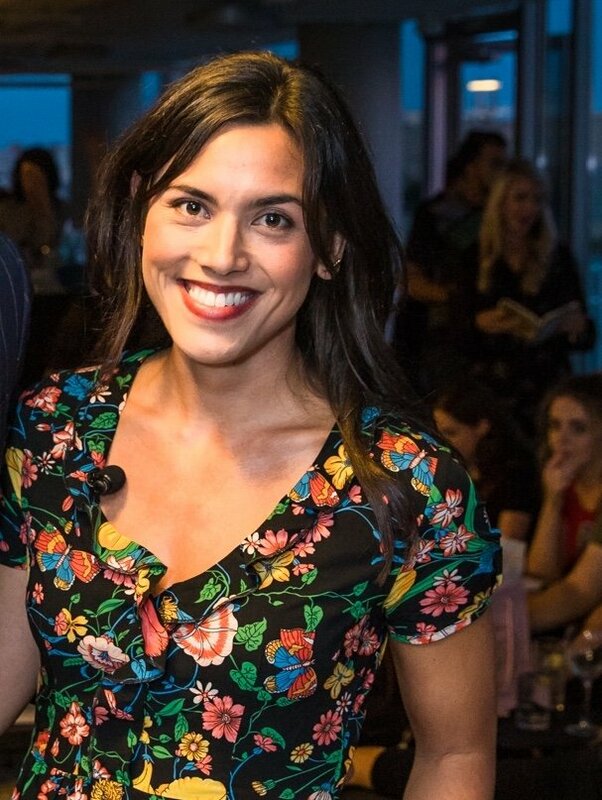 The architecture firm Gensler designed the nine-story building, while Olvia Demetriou of HapstackDemetriou+ is behind its interiors. “What we tried to do here is go for something that is classic,” says Steve Cassell, chief operations officer at Four Points. “We wanted to build a building that would stand the test of time, that wouldn’t be tired in 10 years.” Cassell says he’s gotten interest from a number of potential tenants for the retail space, including fitness studios, co-working companies, and bars and restaurants. “We’re really excited about the critical mass [of bars and restaurants] that’s already been established, and we’re confident we’ll add to that,” he says. Here’s a first look at the newest renderings of the project. 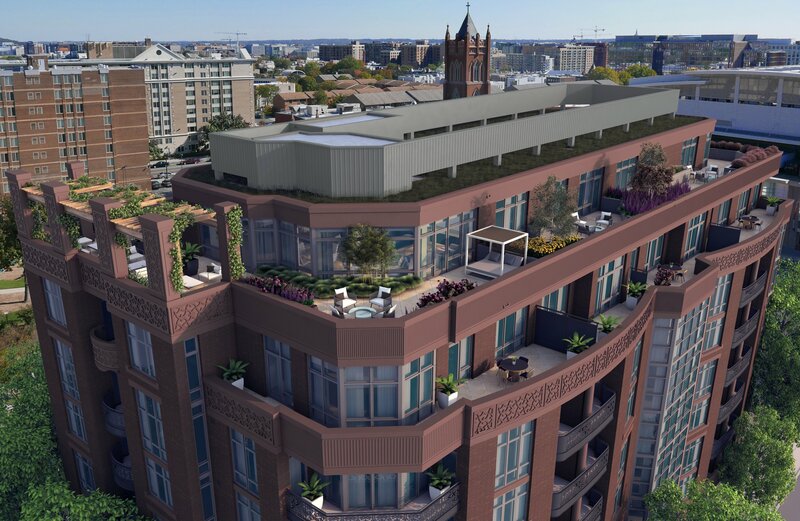 The building’s rooftop will include a fire pit, lounge areas, and views of the National Cathedral and Washington Monument. Perla’s 9th Street-fronting retail could include one large, single user or a mix of operators, says Cassell. 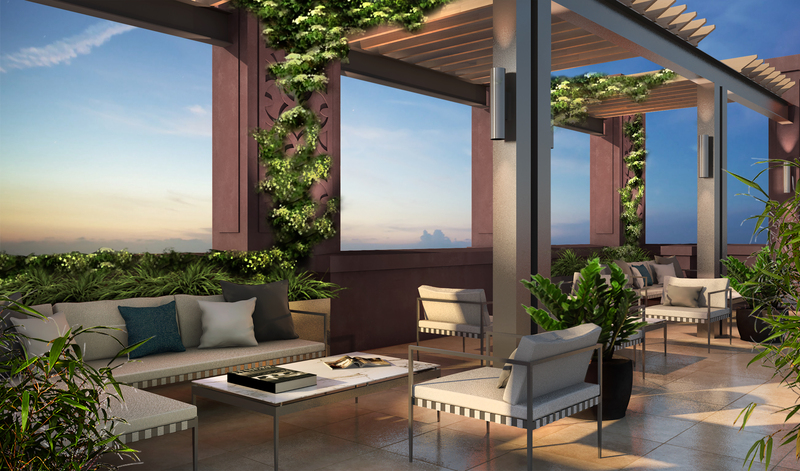 On the ninth floor, residents will have access to the “Skytop Suite,” an indoor/outdoor entertaining space. 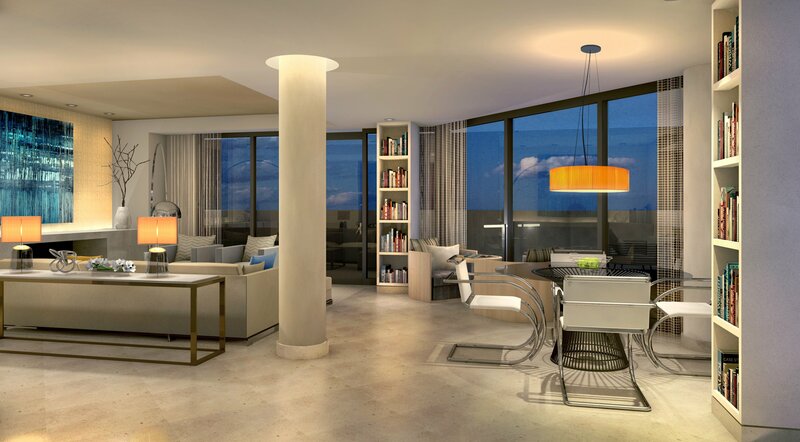 The interior of the Skytop Suite. Another interior view. The catering kitchen in the Skytop Suite. A corner unit condo with two bedrooms, plus a den. Another view of the same unit. 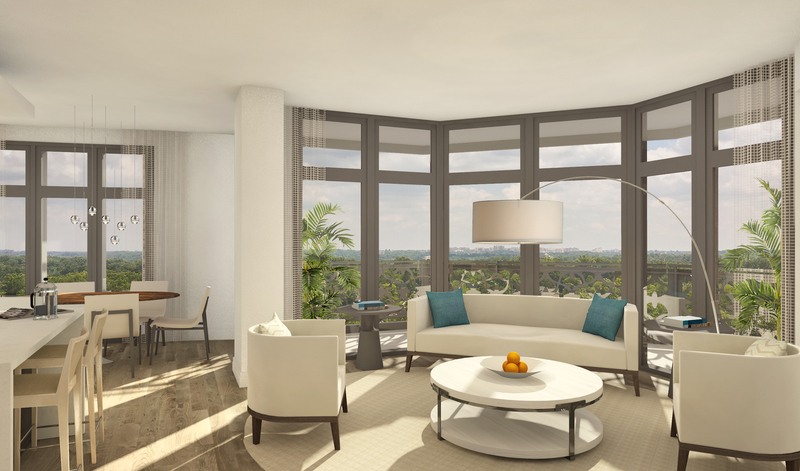 Most of the residences will have private outdoor space and floor-to-ceiling windows. A master bathroom. The building’s lobby.